My “client” took a photo of me during the presentation. 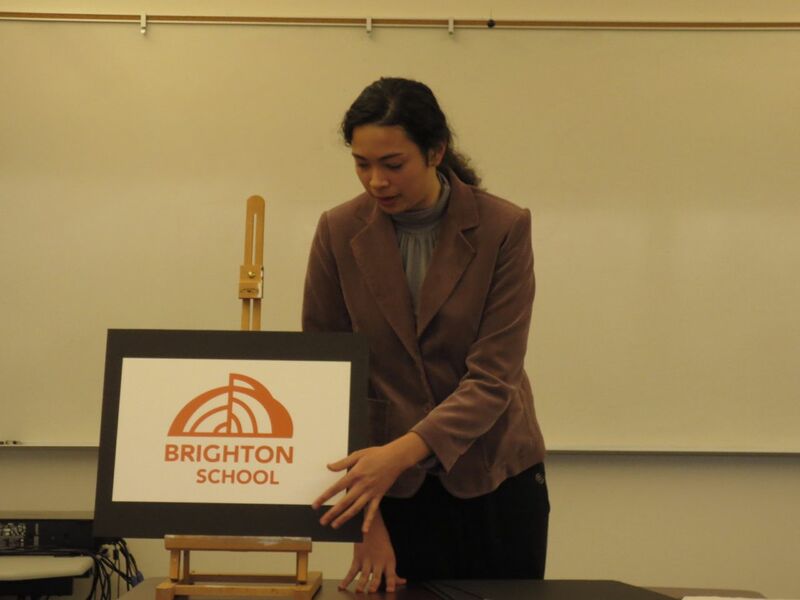 I just completed the quarter-long project of creating Brighton School’s identity, compete with Brand Manual and client presentation (my teacher and classmates were excellent stand-ins for the Brighton School Staff). Here is planned structure of the presentation. It’s always an adventure presenting, blood pumping, all eyes on you. I think there’s often a few points missed. I didn’t mention the stock of paper that I so lovingly picked out. And after hearing everyone else’s pitches, I think would also have wanted to say the words “audience” “meeting needs” and “cost-friendly.” I’m looking forward to future opportunities to really nail it. This is my first Brand Manual. It was a matter of finding a good one on the internet and copying its structure. I think a lot of things are learned like that nowadays. Creating this brand manual was an excellent opportunity to practice my InDesign workflow, creating paragraph styles and master pages to create a consistent look throughout the whole book. Always do the table of contents at the end. I kept adding things and changed the page number references a few times. I greatly enjoyed making photoshop comps of the branded merchandise and field trip uniforms. It always feels gratifying to see a logo I’ve created in a realistic setting. I haven’t considered my skills to have extended to identity until this quarter, but I am excited to get involved in identity projects in the future.